The DREDD movie sequel comic book continues in a brand new mini-series! In the neglected sector of Mega-City One known as The Spit, tensions are reaching boiling point amongst the citizens as the shiny new mega-block Oemling Tower is being constructed for those that can afford to live in it. As the Judges face running battles with rioters, the underground movement known as Uprise stokes the flames of dissent... 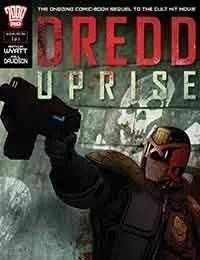 Written by Arthur Wyatt (Dredd: Underbelly) with art from Paul Davidson (X-Men Legacy), DREDD: Uprise will be available from all good comic book stores and online from 2000 AD!